You might want to check the App Store for some of your favorite apps that you couldn't afford because a lot of apps are getting discounted. Gameloft, in particular, are having a $.99 sale on some of its most popular games: Hero Of Sparta, Brothers In Arms, Terminator Salvation, Blades Of Fury (my favorite), Shrek Kart (which I just bought), Real Tennis 2009 and Castle Of Magic. I also bought iGOG: Massive Drums [iTunes link] which has amazing touch-sensitive touch pads that makes live drumming on the iPhone a real possibility. It also has a recording feature. iGOG is on sale for $2.99 down from $4.99. AppShopper.com has a full list of all the apps that have price discounts. Cisco has a new app out called Cisco SIO To Go [iTunes link] which gives you updates on threats to your network on your iPhone. Cisco has also made an interesting video showing how it can save security professionals from a lot of annoying alerts. Obviously, this is for people who are in the information technology field. But, you can also use it to check the reputation of a particular site you're visiting. I was kind of bored tonight. Sure, I could have gone out and made an impulsive tech purchase. Or, I could jailbreak my iPhone! Jailbreaking the iPhone is FREE. It was easy. I just followed a BlackRa1n tutorial available from my friends at the iPhone Download Blog. My carrier is AT&T so I didn't have to unlock. I downloaded Cydia and Rock listings for jailbroken iPhones. Since Cydia is the more popular one, I stuck with that for my initial customization. I downloaded Categories, Winterboard, Cycorder and Qik. The theme is called Blue Thunder and it put in all those wonderful icon replacements. The Wi-Fi icon is replaced by the Apple logo and the Acura logo replaced the AT&T logo. This is my lock screen. It's an Acura TSX, which I am leasing (and will eventually purchase). The brighter the headlight, the stronger the battery life. The target on the bottom is where I swipe to unlock the iPhone. When you swipe, a fingerprint appears which is a nice touch. I added everything I want to for now. I'll take this jailbreaking thing slow. I'll share good stuff I find in Cydia or the Rock on this blog. One of my favorite games when the iPhone 3G came out last year was Asphalt 4: Elite Racing. That really got me hooked on iPhone gaming. Up until then, one of the more graphic intensive games had been Crash Bandicoot Nitro Kart 3D. I spent a lot of the Thanksgiving and Christmas holidays playing it. The next racing game from Gameloft was Ferrari GT: Evolution. I wasn't a particular Ferrari fan but I liked it better than the other racing games on the iPhone at the time. After I maxed out both games, I got Need For Speed: Undercover. Although that was pretty fun, it had a little too much storyline for me and I hit a wall I couldn't get past. Someday I want to finish it though. And now, Gameloft has come out with Asphalt 5 [iTunes link] for $6.99. I already ran a couple of races with two different cars. It's a lot more of the same great gameplay along with better graphics (although the graphics are not as good as some other racing games) and the shortcuts are more interesting. I have only played one course so far though. I love hitting things on the side of the road and eliminating other opponents. If you have an iPhone 3G I would suggest a reboot before starting up the game. It is very graphic-intensive. I give it a hearty 5 stars because it is the next-generation of my first love on the iphone. iPhone Case With A Light! 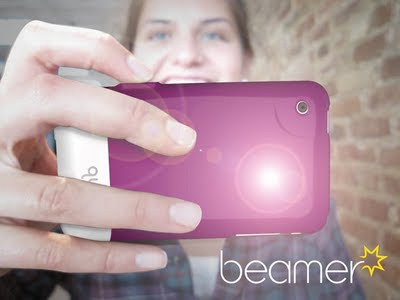 The good folks at quirky.com have made an interesting new iPhone case that features a bright LED light! It's called Beamer. Okay, I have to admit when I saw this I rolled my eyes. I thought to myself, "Isn't there an app for this?" Well, reading more about it I found out that the LED light can be used as a flash for the iPhone camera. Fantastic! It's also great that the LED is powered by a user-replaceable Lithium coin cell battery, so it's not using up the iPhone's battery. At quirky.com, users of the website get together idea for different products. The Beamer is just one of them. Since the product was just developed, the website is taking pre-orders right now for $32.00 per case. I already put in my pre-order. When there are 500 pre-orders, the product will ship. The shipping is FREE in the U.S. if you pre-order. If you want to wait until I get the product, I will do my own review right here. But, if you want to help with your own pre-order, click here. If you like first-person shooters and iPhone games, then this is the game for you: Eliminate Pro [iTunes link]. And it is FREE! There are in-game costs for energy cells but that's only if you're a real insistent player. I don't have that much time to play every day so I wouldn't buy the energy cells. Try it! It's FREE!